Pallet rack uprights are in constant danger from forklift trucks, pallet jacks and just about any portable piece of equipment found in the warehouse or manufacturing environment. Seeming slight damage to this formed piece of metal will reduce it’s ability to do it’s job. It may cause it to fail causing damage to property or more important personnel. Most damage occurs at the bottom of the column. Mighty Lift Post Protectors are fitted to the 3” column most common on North American rack. 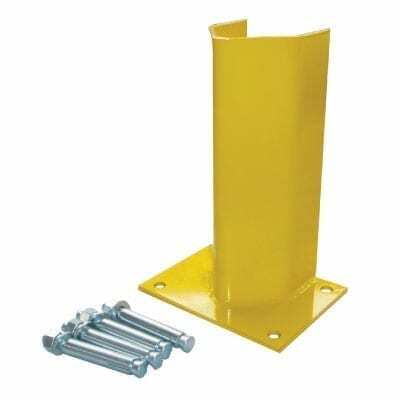 It fits the base plates that are 3” wide and comes in 12” to 24” heights. It lags to the floor with (4) expansion anchors included in the part number. Thickness of ¼” is standard. Other sizes and thickness available on special order. Base Plate 6" x 8" x 1/4"